Paleface and his brother Darkface lived together since birth. The death of their person left them homeless, but they refused to be separated, and so were very difficult to place for adoption. After standing back-to-back against all comers for many years, Darkface has gone. He is waiting for his beloved brother on the other side. 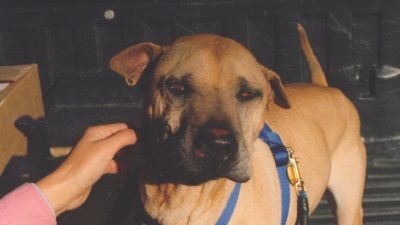 When Darkface died of cancer, Paleface was transferred to the HART sanctuary where he would have a large run, green grass, trees, canine company, and lots of attention. He arrived afraid and none too happy, but it took all of 24 hours for him to fall in love with his new home! 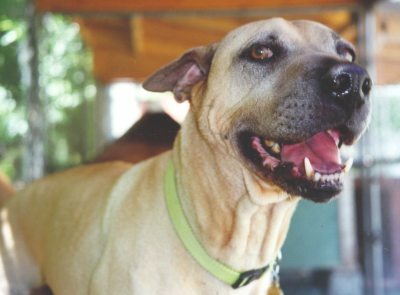 This ten year old Sharpei mix now runs, plays, barks and thinks he is in doggy heaven. He enjoys other dogs immensely...particularly females. He has become quite the "love muffin" at his new home. 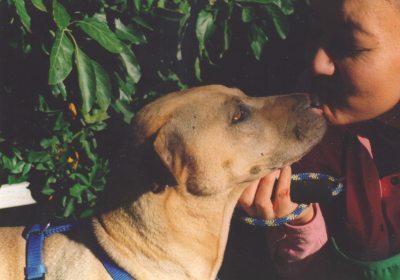 Because of his former abuse prior to rescue, it takes a little time (and a few cookies) to "win him over," but once he loves you, he loves you!